I’m not a fan of crowds. In about a week-and-a-half, Major League Baseball is going to play its All Star Game just a few blocks from the Macworld offices, and, even though I’m quite the baseball fan, I plan to be as far away as my Internet connection and VPN access allow. As much as I love baseball, I hate crowds all the more. You can’t reason with a crowd. If an individual jostles you, you can turn to him or her and say, “Excuse my, kind sir or madam, but you seem to be intruding upon my personal space;” try that with a mass of 12, 18, three dozen individuals, and you are likely to wind up with a bunch of sneaker treads of varying sizes all over your person. Which is why, on Friday, I was perfectly happy to sit back in my office and field reports from other contributors who don’t share my aversion for mobs, angry and otherwise. I’d covered an Apple launch event two years ago for when Tiger debuted, and that about filled my need to be around crowds for the rest of this decade. Judging by the pictures, it looked like people who braved the crowds had a swell time; believe you me, so did I from the safety of my office. There was one potential downside to my decision not to join the multitudes at a nearby iPhone retail location—I wouldn’t be able to get my hands on a phone, certainly not Friday and perhaps not for the foreseeable future. When Steve Jobs himself takes to the pages of the Wall Street Journal to caution folks that there may not be enough iPhones to go around, that’s a pretty good indicator that my dislike of being in close quarters with a mass of mankind is going to cost me, iPhone-wise. Or perhaps not. 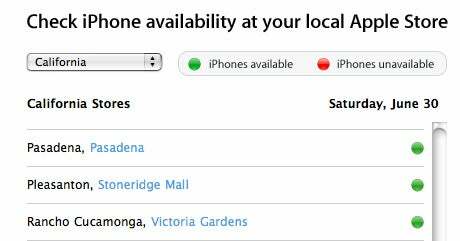 Apple set up a handy iPhone availability indicator to let you know if your local Apple Store still has the mobile devices in stock. A green dot means the Apple Store of your choice still has iPhones on hand. And a red one? Well, better luck next time. I logged on this morning expecting to see a virtual red sea. But so far, all the dots are green. Not just in the Bay Area or California, but everywhere . See for yourself. That status is subject to change, I’m sure. But if you made the decision to hold out for a day on the chance that the iPhone would still be available, it looks like you made a winning bet. I’d be interested to hear from anyone out shopping for an iPhone this weekend about the availability and, more important, the crowds, in your neck of the woods.